Analgesics or pain killers are prescribed for several days following discharge from hospital. Anti-inflammatory tablets may also be taken if the analgesics alone do not control the pain. However anti- inflammatory tables should be stopped as soon as the knee is comfortable and analgesics then continued if necessary. The physiotherapist will see you immediately after surgery. Continuous passive motion may be used to assist in knee flexion. The physiotherapist will see you again on your return to the ward and explain static quadriceps exercises, exercises to encourage full knee extension and to begin knee flexion. Patients are usually able to stand and walk gently with crutches within 24 hours of surgery. Crutches may be discarded as soon as possible and usually in 2-4 days following surgery. A supporting knee brace is usually used for the first f4-6 weeks. This is useful if it is locked in the straight position at night. This encourages full knee extension. Patients are usually discharged from hospital 48 - 72 hours after surgery. After discharge it is important to continue with the rehabilitation protocol. The physiotherapist should give a program to you at the time patients leave hospital. The physiotherapist should also arrange for follow up physiotherapy. This should be undertaken two or three times a week for six weeks and then perhaps once a week for another six weeks. Physiotherapy will be directed initially at controlling any pain or swelling of the knee and regaining a full range of knee motion by 6 weeks. Subsequently physiotherapy will be directed towards balance, muscle reaction and reflexes and proprioception. This is an essential stage in the rehabilitation protocol. The supporting knee brace can usually be removed after 4 weeks. Driving, static cycling and pool exercises can be undertaken after 4 weeks and gentle crawl swimming and gently low weight gym exercises after 6 weeks. Normal cycling, swimming, jogging and golf can usually be restarted after 12 weeks. Squash, tennis and field sports can usually be undertaken after 6 months. You will find that the leg may be painful for the first few hours after surgery. This is quite normal and the pain usually eases by the following day. Generally by the first day after your operation you will be able to get around walking with crutches without too much difficulty. 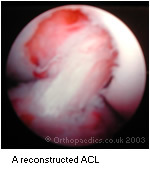 Repair of the ACL usually involves a total of 1 to 2 days in hospital. After you go home, you should keep bending and lifting your knee in order to strengthen the muscles and regain movement. The dressings should be removed after 5 days and the wound inspected. If there is any excessive redness or infection patients should return to the GP or the clinic. Ten to 14 days following the operation you should return to the GPs clinic to have the stitches removed and the wound inspected. Crutches will be used for only 2 - 4 days. A brace is often used to protect the knee for the first 4 weeks when walking outdoors. This has the effect of avoiding excessive activity in this period. The brace is usually worn at night for 4 weeks locked in full knee extension to reduce the degree of morning stiffness. ACL reconstruction by the use of a Patellar Tendon graft is a very safe and successful procedure. Mr. Johnson expects that almost all of his patients should be able to return to twisting, pivoting or contact sports without restriction. A brace is not usually required for these activities. Complications (anaesthetic, medical and surgical) can occur after any surgical procedure. Every care is taken to minimise such problems. The occurrence of such problems should in total be less than in 1% of cases. Possible problems include infection (antibiotics are given at the time of surgery to prevent this), bleeding, swelling, stiffness and venous thrombosis (blood clots). A fever or redness and swelling around the wound, or an unexplained increase in the pain may suggest infection. Increasing calf pain or intermittent chest pain may suggest a venous thrombosis. As with all surgery if at any stage anything seems amiss it is better to telephone or see your local doctor rather than wait and worry. In the first 6 weeks the graft is held in position by only 2 small screws. Any excessive force on the knee produced by tripping, stumbling or doing incorrect or unsuitable exercises may disrupt the integrity of the ligament and it will fail. So take care and listen carefully to the advice given by the physiotherapist. One particular problem is the formation of excessive scar tissue inside the knee. Early movement and physiotherapy minimises the problem. Very occasionally further arthroscopy after 3 months is sometimes necessary. If all goes well you may expect a knee that is stable, does not give way, has a full range of motion, is pain free and you will be able to play sport at the same level as prior to injury. If skiing I always advise the use of a brace to protect the new ligament. Despite all the efforts of the patients, the surgeon and physiotherapists and usually as a result of a further significant injury, in very a small proportion of patients the ligament will fail. In this situation further measures may be considered. Mr. Johnson normally expects the vast majority of ACL reconstruction patients (in the region of 95%) to be able to return to their chosen sport without any significnat knee problems. If your job is sedentary and mostly sitting you may wish to return to work after only 1 or 2 weeks. If your job is physically demanding and requires standing or walking for most of the day, your return to work may take 6 to 8 weeks. Driving can usually be performed after 4 weeks providing that the knee is pain free and you are able to make an emergency stop. Exercises in a pool can usually be started after two weeks when the wounds have healed. Gentle swimming and cycling on an exercise bicycle should be undertaken after 4 weeks and light weight training may be undertaken after 6 weeks. This will speed up the rehabilitation. Breaststroke swimming should be avoided during this time. The knee should be protected from impact and excessive strain during this time. After 3 months normal outdoor cycling, normal swimming, weight training and golf may be undertaken. Gentle jogging on a straight line on a running machine or grass should be performed. After 6 months normal running including rough ground and twisting can be performed. Tennis, badminton and non competitive squash is allowed. Training for soccer, rugby, hockey and basketball may be started with gentle kicking of a ball but tackling should be avoided in recreational athletes at this time. Professional atheletes may wish to return at a slightly earlier time in the rehabiltation process. After 9 months competitive, soccer, rugby, hockey and basketball may be undertaken but the ligament will not reach its full strength for 12 months, so take care. At 12 months full return to sporting activity and skiing is allowed.